In my first couple of ministries, I worked with college students in our church. One of the highlights of the year was taking them to the annual Passion Conference led by Louie Giglio, Chris Tomlin, Matt Redman and all the other cool kids of the modern worship movement. It was always an opportune few days to get fed and inspired about God, church and life. One year, I had the opportunity to meet Matt Redman, and being a fan, I asked him for an autograph. As a young worship leader, he had truly inspired and shaped my outlook on worship ministry and songwriting through his songs and books. He was kind enough to indulge my cheesiness with an autograph and above his name he wrote, “Love & love God." “Jesus replied: ‘Love the Lord your God with all your heart and with all your soul and with all your mind.’ This is the first and greatest commandment. And the second is like it: ‘Love your neighbor as yourself.’"
Jesus made it simple. It's about one thing: LOVE. 1. REACH OUT TO THE UNREACHED - A worship leader has visibility and influence in the local church. More than likely, most people know you, even if you do not know them. The challenge for the worship leader is to get off the stage, out of the green room and into the lives of the attendees. Use your influence for good. Use it to love and spend time with the people. There are people in your church that no one talks to or knows. They are the nameless and faceless that need to be exposed and loved. Look for opportunities to lead the way in that. Jesus definitely did that. He broke down social walls in John 4 when he reached out to the Samaritan woman at the well and truly led her to worship. Who are the unreached that God has brought to your church? Who are the nameless and faceless that you have the influence to expose and love? 2. JOIN YOUR CHURCH - Just because you lead worship on a Sunday, it does not disqualify you from being in a small group or serving during the week. Remember that everyone that serves voluntarily has a job, a family and a life that does not revolve around your ministry. They serve because they want to and because they love God. Worship leaders should have the same heart and attitude. I’m vocationally full time in ministry. I work for the church and I get paid for it. My wife and I host a small group. I separate those responsibilities. I do not host a small group, because I get paid for it. I do not consider it part of my job or weekly work schedule. I do it to join my church in it’s mission. I do it because I want to get connected to the people of my church. It’s all about having the same heart that Jesus had for the church. In Ephesians 5:25, it says that Jesus loves the church and He gave His life for it. Worship leaders need to have the same heart. Love your church. Join your church. They need you and you need them. 3. MAKE DISCIPLES - Every worship leader and church leader needs to memorize Matthew 28:18-20. Jesus clearly tells us to GO and MAKE DISCIPLES. How amazing is that?! The Maker of it all has asked us to make disciples. Every church's vision and mission statement should have the end goal of discipleship. 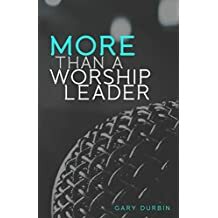 God gave me a burden for intentional discipleship several years ago and I have found more fulfillment OFF STAGE discipling others than I have ON STAGE leading others in song. Don't settle for just being in front of people. Be in the lives of people and have a heart for the great commission of Jesus. There’s nothing more loving you can do than to invest in someone and teach them how to grow closer to God and show them how to help others. That’s discipleship. Discipleship is equipping others to do the work of the Lord. I feel like worship leaders are often more focused on equipment than they are on equipping. Let’s change that! Let’s love people! “If I speak in the tongues of men or of angels, but do not have love, I am only a resounding gong or a clanging cymbal."